Born January 14, 1967 in Toronto, Canada, Michael Schleifer was the son of Jamaican immigrants who moved to Canada before he was born. His German paternal grandfather immigrated to Jamaica and took a Jamaican wife after which they bore Michael's father. Michael took up chess at about nine years old. After taking up other interests for three years, he returned to chess and was taken to a chess tournament by his older brother. He was immediately fascinated by the game and later mentioned that he was intrigued by the struggle. It took him only three years to become a National Master and he become a top junior in Canada. 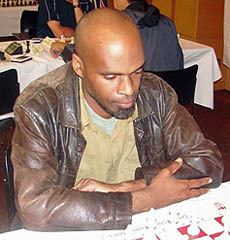 He competed in a number of tournaments both in Canada and in the U.S. He placed in the under-2300 section at the strong New York Open in the early 90s and had begun making strides in his play. He became a FIDE Master in 1997 and an International Master in 1999 at the Canadian Closed tournament. IM Schleifer was known as a very private man, but was a warm friend to those who were close to him. His was known to display his sharp wit. Michael traveled to New York in 2001 to play in the historic Wilbert Paige Memorial tournament. It was here that he made a deep impression on his opponents who complimented his uncompromising play. He came in joint second with IM Watu Kobese with 6/9. Both were 1/2-point behind the winner, then-FM, now IM Stephen Muhammad. He reached his peak FIDE rating of 2400 in January 2002 and had an extensive record of tournament success before turning to poker. One of Schleifer's friends Brad Thomson remembered that "Schlee" was a lightening fast calculator and tactics were his strength. He seem to play a variety of openings and positions which made it difficult to prepare for him. Thomson remarked, "I loved watching Michael destroy all takers at blitz. And no, he was certainly not a trash-talker. He just played the position, and was always gracious to his victims." In fact Louis Robichaud recalled an incident where he graciously allowed him to correct his clock without seeking a penalty. It was this flexible demeanor that won him praise in his homeland of Canada. Schleifer was working as a full-time coach and professional, but had also taken up the craft of poker. He had many challenges in life and was said to have been deeply affected by the sudden loss of his father years ago. It was with great shock that the Canadian chess community learned that on November 21, 2009, he had departed life. According to his brother-in-law Paul Taylor, he succumbed to a brain aneurysm. He certainly left lots of admirers behind in Canada and abroad… his spirit will be missed.